Alastair has performed throughout the world as a traditional and classical performer. Here he blends his versatile fiddle sound with one of Scotland's rising stars. Cellist Alice Allen has already recorded alongside many of the country's top artists including former BBC young traditional musician of the year Robyn Stapleton, the multitalented Innes Watson and more recently guitar supremo John Goldie. 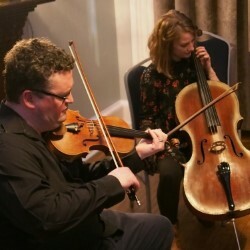 The concert features great fiddle composers of Scotland's past including Niel Gow and James Scott Skinner, as well as folk inspired sounds from other nations including Ireland and America.